Betty Zhang: I graduated from OCAD University for illustration. During that time, I studied art and art history in Florence for a year. We’d drink wine, eat amazing food, and I was free to get into drawing and painting. After I graduated, I worked as a graphic designer while painting in oil and mixed media. I worked for a couple of start-ups, including co-founding my own in the years after graduation and on the weekends, I put up exhibitions to sell artwork. In recent years, I had been seeing a lot of work that merged science, engineering, and art as well as art and design playing a much more strategic role socially, economically, and politically. This made me look for something more as an artist and designer. So I took a master’s in interaction design communication at the University of Arts London, UK. I now work in interactive and immersive media and work as a designer at Tribalscale Venture Studio. BZ: Over the years, the main driver of influence in my work has been the experiences I’ve had living in many different countries and meeting different people. I am also influenced by the place I am in and other collaborators. I find that working with other practices has been a huge influence for me as an interdisciplinary artist. I have background in dance and have also been doing performance based projects. I love to work with dancers as the human body’s movements inspire me. I explored this even further during my master’s, where I took gestural interactions as a main source of inspiration. BZ: The human body and the environment that they occupy. I observe how human interactions happen and how the body moves through space, the motion and gestures associated with different activity. I also question why we move the way we do and how may we change those habits. In addition, I am extremely interested in how these natural interactions are effected by digital technology and artificial futures. I often think about human emotions and how body gestures are associated with them, and about how affective computing may play into all of this as digital technology is becoming an essential part of modern humanity. BZ: My recent work has revolved around how the body moves through space, both physical and digital. I am exploring how the embodied self is effected by digital identity and how the physical and digital become one in the future world we live in. How might human habits be altered through digital technology and how do humans represent themselves digitally. In this case, the environment involves the concrete spaces we occupy and digital interactions we produce. RB: Following on from this, how do you imagine the body will interact with the environment in the future? BZ: In the future, the body will be both represented digitally and physically. They do not necessarily relate but coincide and live alongside each other. The experiences we will have as humans will be inseparable from digital and physical interfaces, the real and unreal. The digital will run through and inside the human body and become one with our interactions with each other and other non-human entities. The digital responding to the physical and vice versa in a seamless form. RB: Your work, The Extimacy Dress, senses the wearer’s level of arousal through micro-gestures and affective states. Can you say more about this work? BZ: This was my thesis research and practical project which came out of some of my deepest obsessions and an amazing collaboration. I am interested in how our gestures speak as interactions and how the body interacts with the space around us. I chose to join this with my interest in emotions. 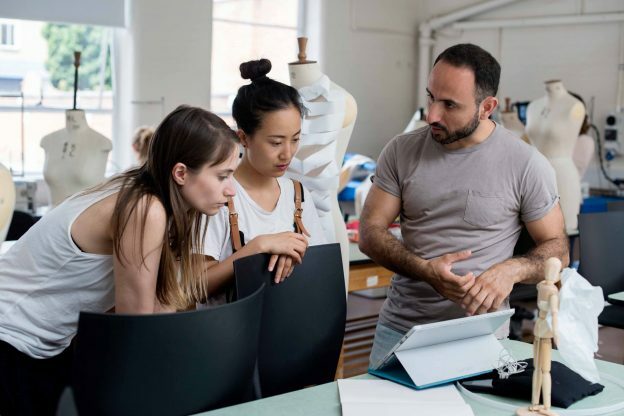 The collaborator I was working with, Hana Zeqa from London College of Fashion was also interested in exploring emotions through her costume design thesis project. I chose human attraction and arousal as an area of focus and researched about the micro-gestures that represent your attraction before you are even consciously aware. Prior, I was also curious how body gesture has changed because of new rituals we’ve adopted from interacting with digital technology. 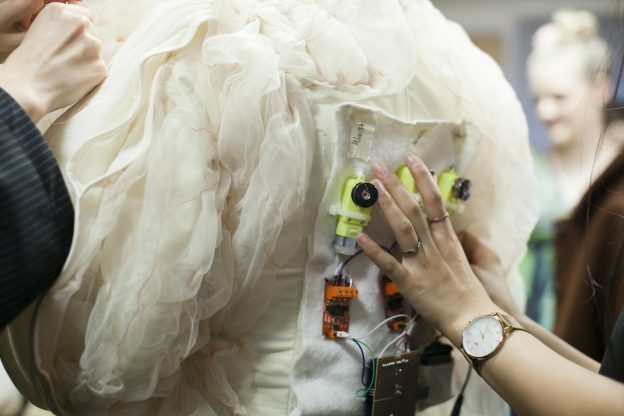 Then, I worked with Hana to make a dress that senses its environment and other people through gesture machine learning and bio-sensor attached to the wearer of the dress. 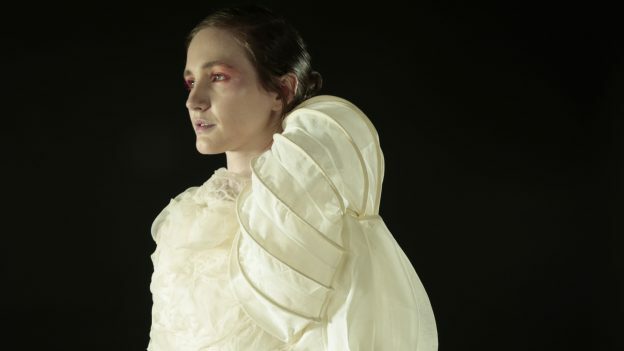 When the sensors find that the wearer’s heart beat is rising or are making more micro-gestures previously to be understood as a sign of arousal, the dress would express this by transforming its shape and opening up. We turned the exhibition of the dress into a choreographed performance and dance, which was performed at Sadler’s Wells Theatre in London, UK. 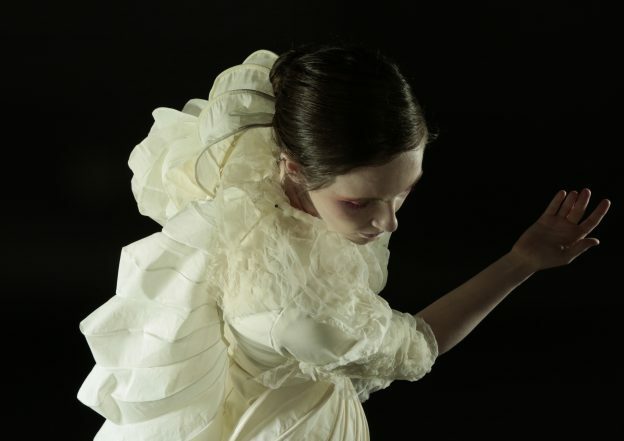 I worked with the performer and main choreographer on the movements that would tell a story of emotion, but it was interesting that the choreography, dancer, and dress as an entity on its own had to all work together. Through this project, I was also looking at how non-human sensors, computers, and digital code can learn to understand emotion, to detect emotion. This feeds into an area of study called affective computing. In the future, I am still exploring how our emotions are effected by gesture and if the future is the singularity, how will digital gestures affect us. RB: Can you say something about your project Rainmaking on Mars?